"Color and light" were prolific artist's trademarks. 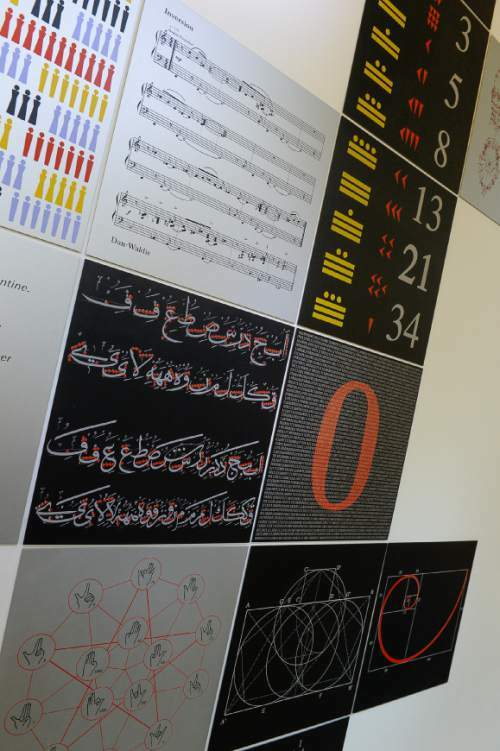 Francisco Kjolseth | The Salt Lake Tribune In this file photo, the work of artist and architect Anna Campbell Bliss is seen at the Cowles Mathematics Building on the University of Utah campus with her piece entitled, "Extended Vision." The acclaimed Utah artist died this week at age 90. 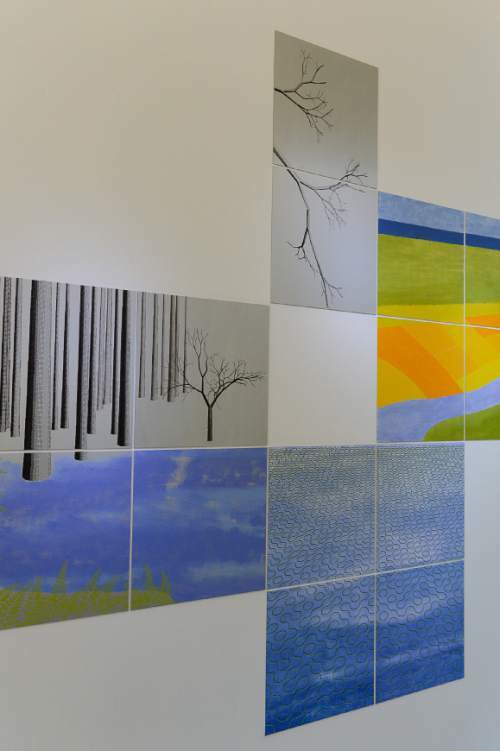 Francisco Kjolseth | The Salt Lake Tribune In this file photo, the work of artist and architect Anna Campbell Bliss is seen at the Cowles Mathematics Building on the University of Utah campus with her piece entitled, "Extended Vision." The acclaimed Utah artist died this week at age 90. 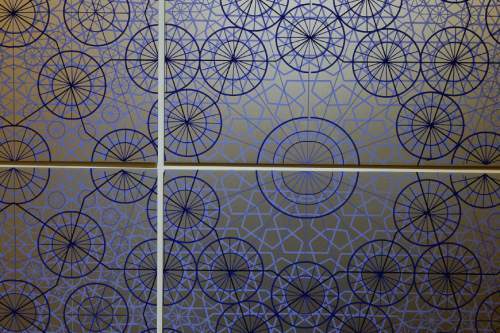 Francisco Kjolseth | The Salt Lake Tribune In this file photo, the work of artist and architect Anna Campbell Bliss is seen at the Cowles Mathematics Building on the University of Utah campus with her piece entitled, "Extended Vision." The acclaimed Utah artist died this week at age 90. 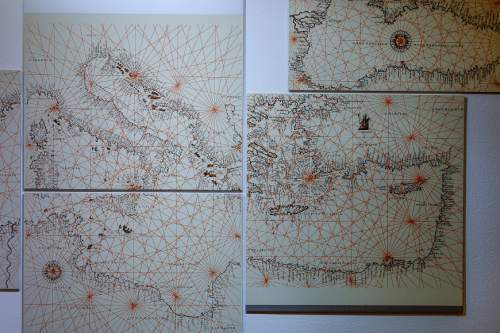 Francisco Kjolseth | The Salt Lake Tribune The work of artist and architect Anna Campbell Bliss, who mixed art and science in her work, can be seen at the Cowles Mathematics Building on the University of Utah campus with her piece entitled, "Extended Vision." 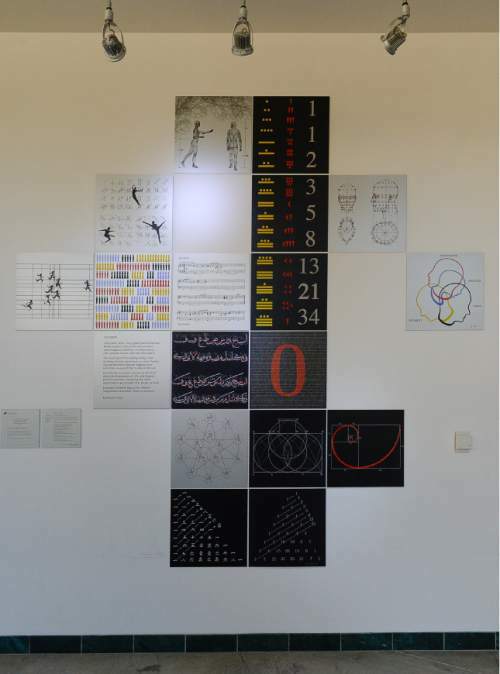 Francisco Kjolseth | The Salt Lake Tribune In this file photo, the work of artist and architect Anna Campbell Bliss is seen at the Cowles Mathematics Building on the University of Utah campus with her piece entitled, "Extended Vision." The acclaimed Utah artist died this week at age 90. 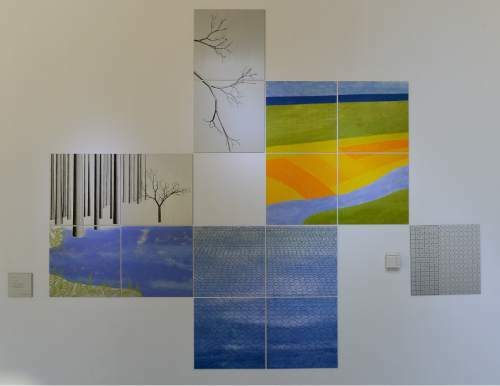 Francisco Kjolseth | The Salt Lake Tribune In this file photo, the work of artist and architect Anna Campbell Bliss is seen at the Cowles Mathematics Building on the University of Utah campus with her piece entitled, "Extended Vision." The acclaimed Utah artist died this week at age 90. 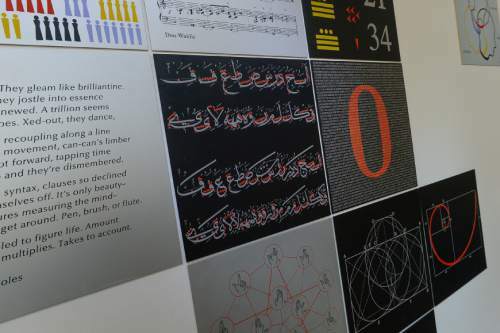 Francisco Kjolseth | The Salt Lake Tribune In this file photo, the work of artist and architect Anna Campbell Bliss is seen at the Cowles Mathematics Building on the University of Utah campus with her piece entitled, "Extended Vision." The acclaimed Utah artist died this week at age 90. Tribune file photo Reflections, 2007, computer-based image with screen printing on Rag paper by Anna Bliss. The acclaimed Utah artist died this week at age 90. 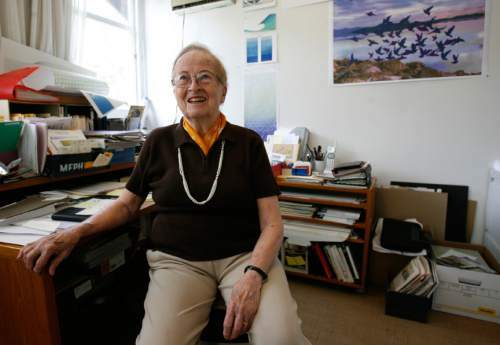 Tribune file photo Anna Bliss is pictured in her home office in 2009. The acclaimed Utah artist died this week at age 90. 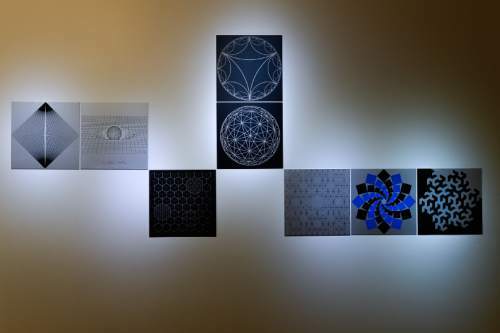 Francisco Kjolseth | The Salt Lake Tribune In this file photo, the work of artist and architect Anna Campbell Bliss is seen at the Cowles Mathematics Building on the University of Utah campus with her piece entitled, "Extended Vision." 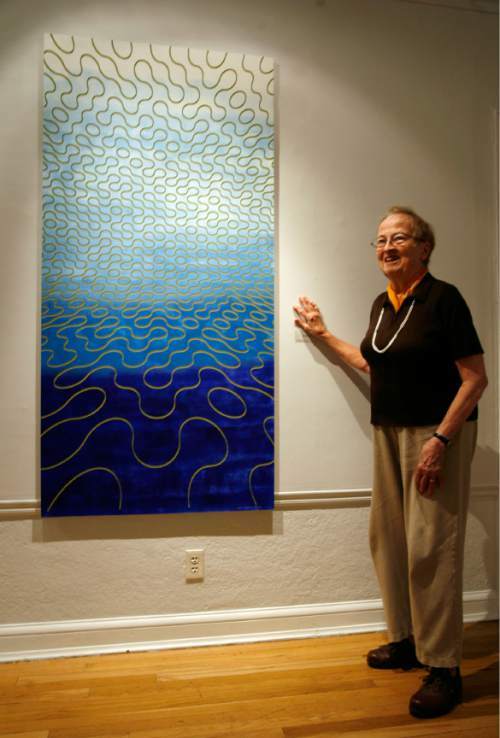 The acclaimed Utah artist died this week at age 90. 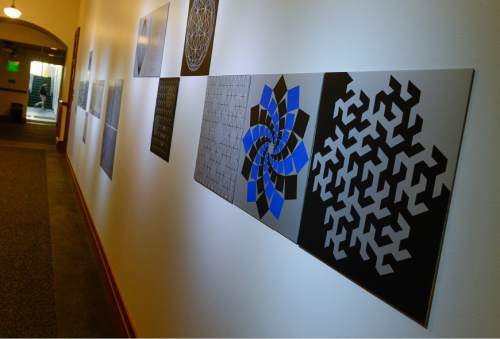 Francisco Kjolseth | The Salt Lake Tribune In this file photo, the work of artist and architect Anna Campbell Bliss is seen at the Cowles Mathematics Building on the University of Utah campus with her piece entitled, "Extended Vision." The acclaimed Utah artist died this week at age 90. Tribune file photo Butterfly Landing I, 2009, Digital print and oil on Rives paper by Anna Bliss. The acclaimed Utah artist died this week at age 90. Tribune file photo Anna Bliss speaks about her piece "Water Wall" in 2009. The acclaimed Utah artist died this week at age 90. 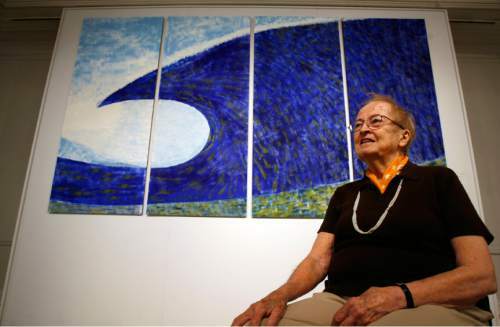 Tribune file photo Anna Bliss is pictured by her piece "Tsunami", oil on rives paper, in 2009 The acclaimed Utah artist died this week at age 90. Tribune file photo The art of Anna Campbell Bliss during a 2004 exhibit at the Utah Museum of Fine Arts. The acclaimed Utah artist died this week at age 90. 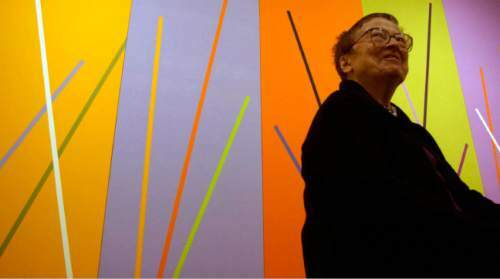 Anna Campbell Bliss, an acclaimed artist and architect who combined color and line, science and technology, and movement and the human form into her many works, died Monday morning in her Salt Lake City home. She was 90. Bliss&apos; works often explored the overlap between art, mathematics and science, said Ben Butler, a Salt Lake City architect and Bliss&apos; former assistant. Bliss, Butler said, believed "there&apos;s art in everything  it&apos;s all in the way you approach it." Some of Bliss&apos; most recognizable work in the Salt Lake City area includes: "Windows" (1989-90), a 30-foot-long mural of squares in the Utah State Capitol&apos;s data processing center; "Discoverers" (1996), a mural evoking the Salt Lake Valley&apos;s topography, in the Salt Lake City International Airport&apos;s Concourse E; "Light of Grace" (1993), a stained-glass window wall in St. Thomas More Catholic Church in Sandy; and "Extended Vision (2001-03), a series of etched and screenprinted plates depicting math theories, in the lobby of the University of Utah&apos;s Cowles Mathematics Building. 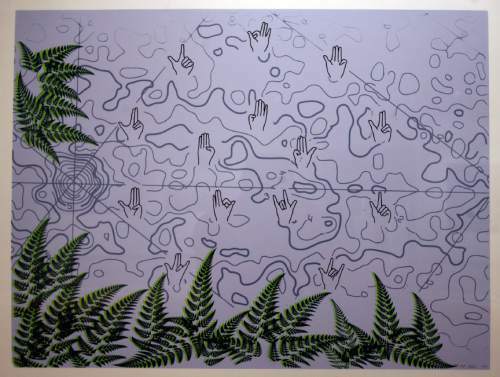 Bliss&apos; works can also be found in the collections of the Utah Museum of Fine Arts, the Utah Museum of Contemporary Art, the U.&apos;s Marriott Library, Alta&apos;s Cliff Lodge, the Metropolitan Art Museum in New York and the Art Institute of Chicago. Anna Campbell Bliss "sort of defies category," said Whitney Tassie, curator of contemporary and modern art at UMFA. Though she incorporated all manner of subjects into her art, Tassie said, "her main focus was color and light." "The caliber of her mind and her talents, and her contributions to art, are unsurpassed by any [artist] who spent their lives in Utah," said Adam Bateman, executive director of the Salt Lake City gallery CUAC, which hosted one of Bliss&apos; last exhibitions, with her architect husband Robert Bliss, this summer. Anna Campbell was born July 10, 1925, in Morristown, N.J. She earned a bachelor&apos;s degree in art history and mathematics from Wellesley College in 1946, and a master&apos;s degree in architecture from Harvard in 1950. She was influenced by the Bauhaus movement, studying with the art theorist György Kepes at MIT, and later with the artist/educator Josef Albers. In 1947, Butler said, she met Robert Bliss at a dinner party. "He ended up escorting her home, and they were married three months later," Butler said. She was 22, he was 26. They remained together 68 years, and she died holding his hand, Butler said. They traveled around Europe after they got married, "living as poor as they could in Florence," Butler said. In 1954, Robert got a job teaching architecture in Minnesota, and he and Anna started their own architectural practice, Bliss & Campbell Architects. They designed houses, Butler said, that were known for their style and sense of material  incorporating the natural setting in which a house would be built. In 1963, Robert applied to be head of the University of Utah&apos;s Department of Architecture (now the College of Architecture + Planning). "He was their first choice," Butler said. He served as department head, and later dean, until 1986. The move to Utah didn&apos;t sit well with Anna at first. "I&apos;ll admit I was in a very depressed mood when I got here," she told The Salt Lake Tribune in 2012. "I was very involved with the Walker [Art Center] and Minneapolis&apos; art scene. I didn&apos;t find that degree of stimulation in the art world here." So, she helped create that stimulation. She focused on art, Butler said, and found inspiration from many sources. She explored computer programming, while also researching dance and human movement with Repertory Dance Theatre. She also took courses in screen-printing, which Butler said became instrumental in her artworks. She received major commissions, such as her mural "Discoverers," unveiled at the Salt Lake airport in 1996. Creating that work was a case study in testing attitudes about art in conservative Utah. "I included nudes in a minor way, just to establish a relationship between the ideas and people," she said in 2012. "Because of local attitudes, I couldn&apos;t have the nudes." At an assistant&apos;s suggestion, she substituted computer-generated figures. The airport committee that commissioned the work checked up on her from time to time, and she and her assistants referred to them as the "Breast Patrol." Anna also was active in the Utah arts community. In the 1980s, she founded the Contemporary Arts Group, to encourage fellow artists in many disciplines. She served at various times on the boards of RDT, UMFA, and the restoration of the Cathedral of the Madeleine. In a statement, Gretchen Dietrich, UMFA&apos;s executive director, said: "Anna Campbell Bliss was a gifted artist and an ardent supporter of art and creativity in this community for many, many years. Anna was a gifted painter and print maker  and we are proud to have a number of her pieces in the collection of the Utah Museum of Fine Arts. She will be missed." The Blisses entertained guests in the art and architectural communities  both local talents and guest lecturers Robert would bring in from out of town. "Bob and Anna," Bateman said, "are such a power couple in terms of their contributions to the art world in Utah." Butler noted that while the Blisses "had no biological children, they ushered in a whole group of architects and artists across Salt Lake. They&apos;ve become family." Butler became part of that family when he signed on as Anna Campbell Bliss&apos; assistant in 2006. This was after what she called her "blind period," when she began to lose her eyesight. She was diagnosed with macular degeneration, and entered early trials for a treatment at the U.&apos;s Moran Eye Center. The treatment, which Butler said involved injections in her eyeballs once every six weeks for six months, restored her vision. Butler marveled at how energetic Anna would get before an exhibit. "She&apos;d be up nights, dreaming of how it was all going to resolve," he said. "She became immersed in the process of creating these pieces.… Once she had her idea, it just kind of grew and took shape." A memorial Mass will be celebrated for Bliss, Thursday at 11 a.m. at the Cathedral of the Madeleine, 331 E. South Temple, Salt Lake City. Butler said her ashes will be scattered sometime this fall at Hidden Peak.